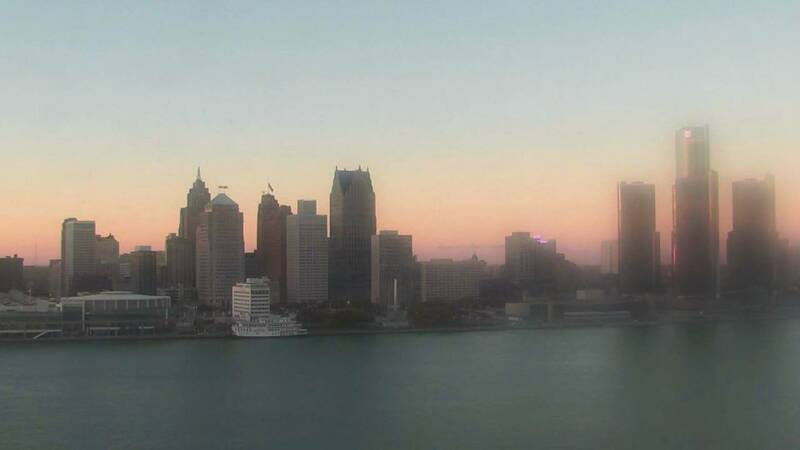 Sunset in Detroit from the Windsor sky camera on Oct. 29, 2018 at 6:22 p.m.
Michigan Democratic gubernatorial candidate Gretchen Whitmer continues to lead Republican challenger Bill Schuette by double digits heading into the November election, a new poll finds. Michigan candidates have begun their final push ahead of elections. Details here. A special task force has begun their probe into mishandling of remains at Detroit funeral homes, with their focus on the Perry Funeral Home. Details here. The fate of a former Michigan State Police trooper, charged in the ATV death of a Detroit teen, is in the hands of a jury. Learn more. VP Pence speaking in Michigan to campaign for Republicans Monday. Learn more. Michigan U.S. Senator Debbie Stabenow continues to lead Republican challenger John James by double-digits heading into the November election. Wayne State University police are searching for a possible second driver connected to the deadly hit-and-run of a 57-year-old woman in Detroit. Several communities have increased security at local synagogues following the shooting in Pittsburgh. Police in Redford Township are issuing a warning to residents as they search for a suspect or suspects in the death of a 65-year-old woman.